Known for his collaborations with Dimitri From Paris, and Daniele Baldelli, Rocca’s playful energy and original song writing shines through. On remix duty is the enegmatic DJ Fett Burger who combines "Spaghetti" and "Fusilli" into an inspired if chaotic amalgamation of stabby synths and percussive drums. 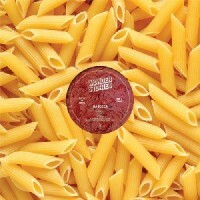 "Spaghetti" is a leftfield house tune with muted bass and eerie synth melodies. 90s house stabs and lo-fi broken beats amp up the track with sultry vocal lines accenting throughout. "Fusilli" immerses the listener in simultaneously tribal yet futuristic landscape of a forgotten and out-of-date biotic engineering. Think a rave in the backroom of the club that was surely hidden away on the Total Recall mothership. Rocca’s studio prowess really shines here, as his analogue. synthesizer and drum machine collection are brought to the forefront. "Penne" slows things down into a slow-mo funk disco-esque tune with sharp stabby synths and a growling bassline. Rocca, ever the multi-instrumentalist, let’s his flute playing shine here, culminating in a seriously vibey aesthetic.